I picked up another bunch of Brussels sprouts recently with the plan to find a way to get my boys to eat them - and like them. Well, that opportunity arrived in my mailbox on Saturday. Taste of Home started a new version of their magazine last year - Healthy Cooking. Soon as I saw it, I had to subscribe. It's filled with subscriber submitted recipes, and all the nutritional information is provided making it easy to use if you are watching what you are eating. Now, I wouldn't normally think that a recipe with bacon would be considered healthy. When the total calories for 2/3 cup of Brussels sprouts with bacon only came to 90 calories I figured it couldn't be too bad. And, as we've all heard bacon makes everything taste better, right? Wink, wink! So, after cooking up the bacon, you reseve just a little bit of the drippings to saute the sprouts and the onions. The flavor from that little bit really adds the right amount of flavor to them and both of My Boys declared it yummy with huge smiles on their faces. Score! We had just a little bit leftover which I plan to have as part of my lunch tomorrow. The saltiness of the bacon really makes it hard to stop eating them. Grumpy's Honeybunch made Oven Roasted Potatoes and Asparagus. LaDue & Crew made a really pretty Orange, Radish and Mint Salad. Joy the Baker sharedsome incredibly crunchy Oven Baked Fries. 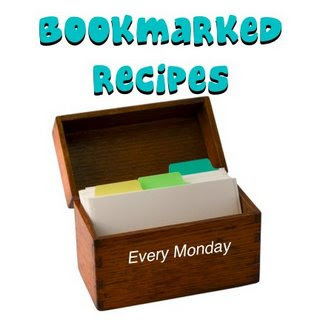 I'm hosting this week's Bookmarked Recipes courtesy of Ruth's Kitchen Experiments. I'm excited to be hosting my first blogging event! If you'd like to participate, simply make and blog about a recipe from a magazine, cookbook, blog or website. Send me the details (see below), and next Monday I'll post the round-up. Easy as pie! In a large skillet, cook bacon over medium heat until nice and crispy. Remove to a couple layers of paper towels; drain skillet, but reserve 1 tablespoon of drippings. Crumble bacon and set aside. In the same pan, saute Brussels sprouts and onion in the drippings, until crisp tender. Then, add water, salt and pepper. Bring to a boil (this won't take long), and reduce heat and simmer for about 4-5 minutes until Brussels sprouts are tender. Stir in bacon and vinegar. Serve hot. What a gorgeous photo. You've managed to make brussels sprouts look beautiful. Wow, you linked to me! That gave me a smile, thank you! Bacon and Brussels are 2 of my favorite foods! I'm trusting you on the 90 calorie part! Your picture is beautiful! I'm trying to talk myself into trying brussel sprouts again....HATED them as a kid and was forced to eat them. :( Your picture and recipe may just do the trick...really looks yummy. Thanks for sharing. this one is worth trying, for sure....the pic looks just yum. Sprouts and bacon are such a yummy combination. I've been getting Healthy Cooking for several years - it used to be called Light and Tasty - and the recipes in the magazine since the redesign have been so much yummier. I'll have to try this one. I am not a brussel sprouts fan but these look so good I might try them. Patsy- These look wonderful. 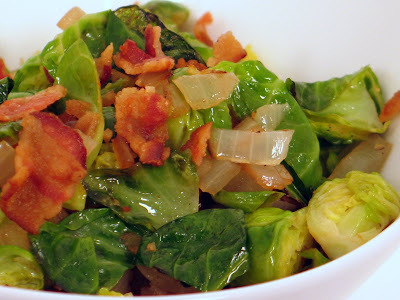 I love brussels sprouts and with bacon. winner!! This is my favorite way to eat Brussels sprouts!